Dinner with the Wandering Foodie (through whose 93 Plates project the meal was comped) found us at Sanford's. Established in 1922 as a coffee shop, it's been made over into a restaurant that still operates 24/7, but with a more polished menu (and a three-page beer list, including tasting notes), moody music, and even moodier lighting. 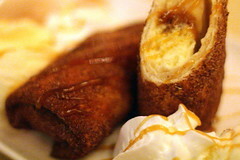 After nightfall, photos were well-nigh impossible; just a passing mention, then, of tender mushroom ravioli and a full-figured pork osso buco, and one photo, of the banana caramel cheesecake xango — a pan-fried, cinnamon-dusted dessert that so many deep-fried bananas wish they could be.